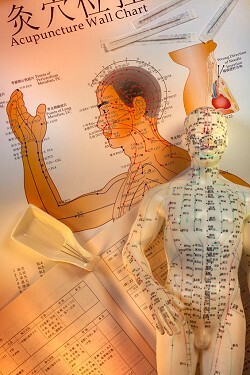 Acupuncture is one branch of Chinese traditional medicine that has been developed and practiced in China, Japan and other Asian countries for at least 2000 years. It is has gained increasing popularity in the West over the last 2 decades which has led to more and more clinical trials being performed that have validated acupuncture's effectiveness. During an acupuncture treatment, very small, fine, and sterile needles are inserted just below the surface of the skin to stimulate certain known points which aim to restore balance and any problems that may have arisen because of this lack of balance. On average I insert between 8-12 needles per session commonly on the lower arms, lower legs, abdomen and back. Acupuncture is effective because it is a holistic therapy that addresses the cause of any disharmony as well as the symptoms and has been tested on millions of people (as opposed to animals!) over millennia. This means that as a result of acupuncture treatment you will experience an overall improvement in the quality of your health as well as relief from symptoms. The sensation of acupuncture can feel like a numb, tingling, or dull aching sensation which lasts only for a few moments. Most patients are obviously a little anxious before their first session but are pleasantly surprised at how painless it is and how relaxed they feel after. Moxibustion is a part of acupuncture treatment that aims to bring heat directly into the body by burning a dried herb called mugwort directly over an acupuncture point or on top of an acupuncture needle. It is used to treat conditions where the patient tends to be cold or weak or where there is poor blood flow and combined with acupuncture the effects are profound. Moxibustion is particularly important for women with a breech baby. For more information on this please see Pregnancy.